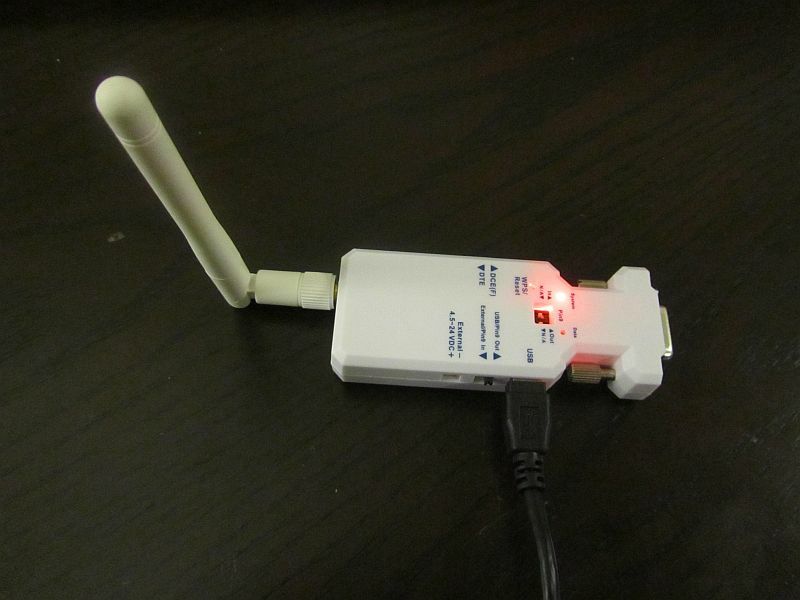 Has anyone used the USConverters Wi-Fi adapter with their smartphone? Sky Safari states that the device is compatible with their app and USConverters states that the adapter is pre-configured to work with most astronomy apps (software)”out of the box”; no going in and setting the adapter to 96k baud, bit rate or stop bit stuff. If it works, it would be cheaper than the Wi-Fi hardware the astronomy products are offering. I wonder if it would work with Celestrons Sky Portal app? Lots of views no input so, I have ordered the Wi-Fi converter, will try it out on my NexStar 11 GPS using my iphone 5s using Sky Safari 5 Pro and post the results here. Do you have the required cable (for the HC)? Yep, I've been using the cable to connect my Bluetooth adapter to the HC. With this setup I have run the scope wirelessly with the laptop using NexRemote or CDC software. I recieved an email from USConverter. The Wi-Fi adapter has shipped; should have it by Friday or Saturday. Report back how it works out. I have two Starry Night BT adapters, but I'm always up for other alternatives as well. The adapter arrived yesterday and I had time to take some photos and check it out. Shipping was fast, only 3 days by USPS. 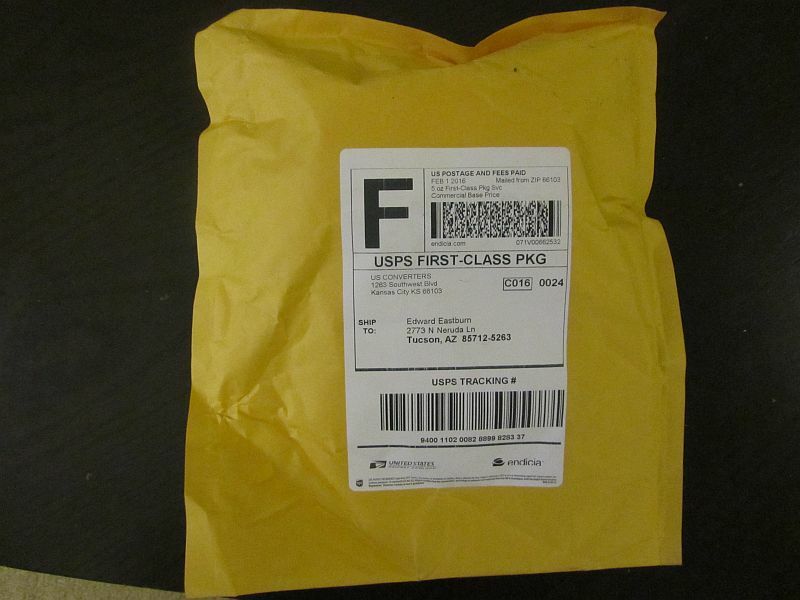 It arrived in a standard yellow, bubble package (pic 1). In the package was a cardboard box with all the goodies (pic 2). Here are the contents of the box. 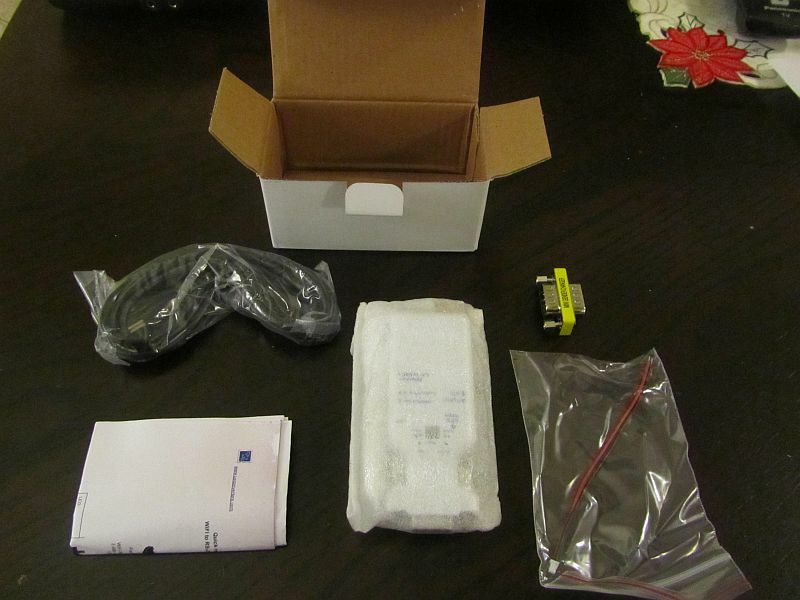 The adapter (middle), a USB/minUSB cord wrapped in plastic (top left), a male/male adapter (top right), a micro DC plug for providing power to the adapter (one of 4 ways) (right), basic info sheet (left) (pic 3). 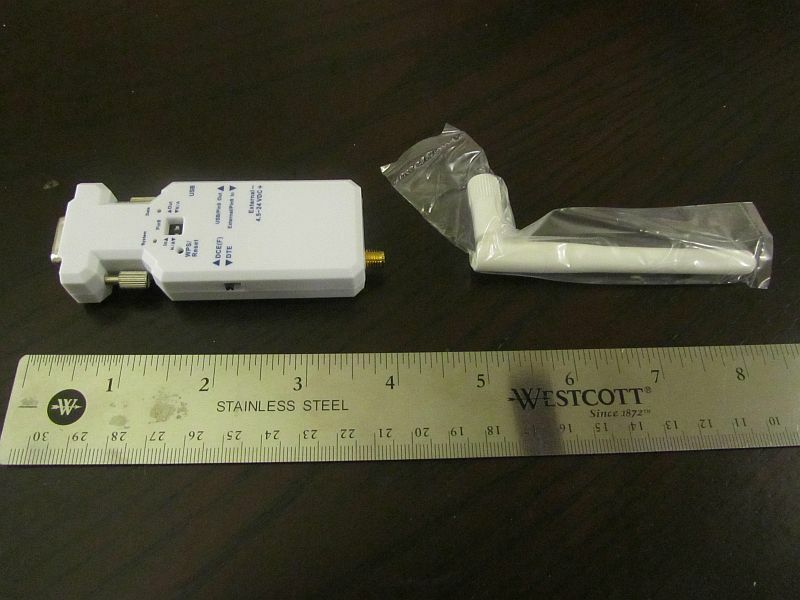 The next two photos show the size of the adapter and antenna (pic 4 & 5). 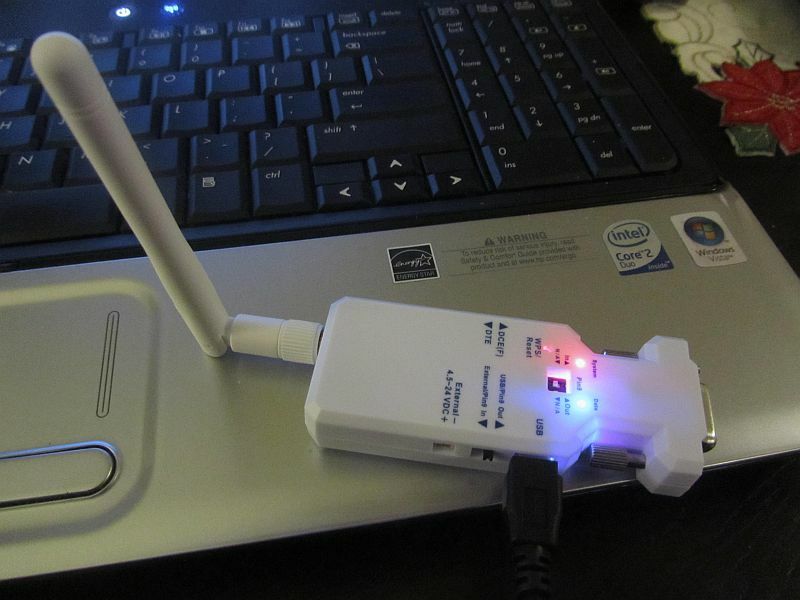 Using the USB cord to provide power from the laptop, a power test was performed; the adapter booted up and signaled it was on (red LED) and looking for a network to connect to (flashing blue LED) (pic 6). Edited by Edward E, 04 February 2016 - 03:52 PM. Using my HP G60 laptop, running Windows 10 Pro, I was able to see the adapter (Serial2WiFi_95_90) and make a connection with it (blue LED steady glow) (top left pic & bottom right pic). 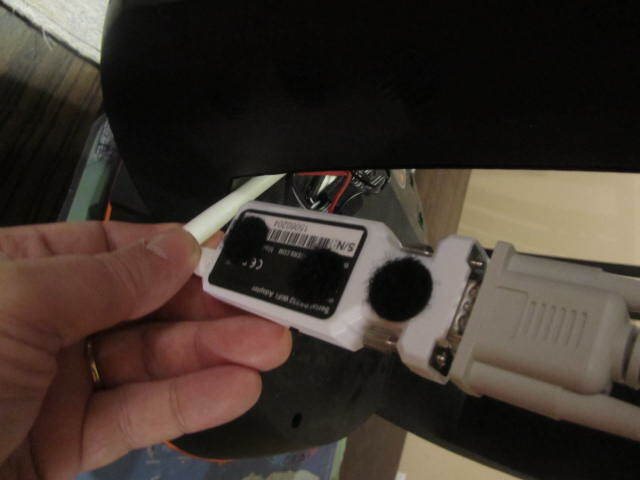 Here is the adapter connected to the Celestron serial cable using the male/male adapter (top right pic). I will be powering the adapter from the 12 volt source on my C11, so I soldered the micro DC plug onto a 2.5mm, right angle, female plug, seen here with the bare solder connection isolated using shrink wrap (bottom left pic). I tested the adapter using this power source and it work like a charm. I was able to make a connect using my iphone 5S but I did not have time to test the connection with Sky Safari 5 pro. I will try that Saturday afternoon and report back the results; so far, so good. I will be happy to answer any questions you might have. Edited by Edward E, 07 February 2016 - 11:35 PM. Looks like It works great. I'll add this thread to my "Fav's" just in case I one day cross over to "Apple" (not likely but ya never know). I realized that in the video I used the term "RJ11" for the plug that plugs into the bottom of the hand controller. I should have called it a "RJ22" plug. Sorry for any confusion. Last night I had the scope out at the clubs observing site and gave the WiFi setup a road test. After doing my normal 3 star alignment, checked that my phone had connected to the WiFi adapter, which it had & started up Sky Safari 5 Pro. My first try to connect to the scope did not go through but a quick check showed that the DCE/DTE switch on the side of the adapter had been moved from the DTE position; moving the switch back to DTE and connection to the scope produced a "connected" result. I had made a list of many different object from various astro catalogs, such as M, NGC, IC, PGC, UGC, SAO and others, to try out. My last alignment star was Rigel, so I zoomed in on Rigel with SSP5 and seeing that the cross hairs were off the mark just a little, I tried the "align" function, making sure Rigel was centered in the FOV of my 6.7mm Sci Explore eyepiece. SSP5 aligned on Rigel and it was off to the races. I went through my complete list of 35 objects in less than 1 hr and SSP5 placed the object in the FOV of my 8.8mm Meade UAO eyepiece every time. I noted the objects in the far North were slightly off to the side of the FOV of the 8.8mm, and planets like Uranus & Neptune were just out of the FOV of the 6.7mm. 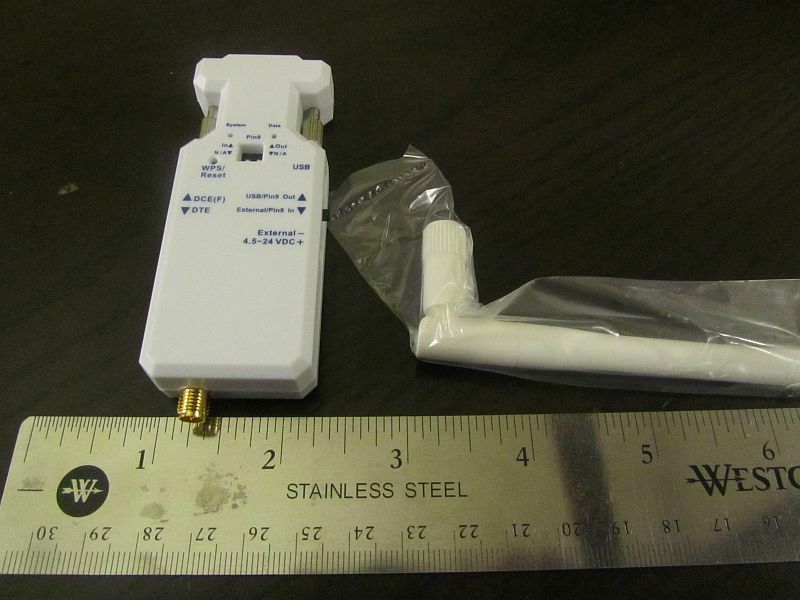 The WiFi adapter never missed a beat and held a steady connection out to 250 feet. I would have gone further out but did not want to be walking around in the bushes in the dark. Placing the iphone in standby for 5 minutes then starting up again caused no issues. I ran the system from all evening and never had a single issue, either with the connection of from SSF5. I can highly recommend the USConverters WiFi - RS232 adapter for running a telescope wirelessly using Sky Safari 5 from a iphone or ipad. It will be interesting to see how future astro apps work out with this setup as they (apps) become available. Very interesting, thanks for sharing. Have you experienced any drop-outs, or connection errors in SkySafari? And, do other nearby WIFI networks cause any problems using this adapter? Also, can you still use the hand controller for controlling the scope without messing up the alignment? Edited by raptor(), 14 February 2016 - 01:36 AM. I tried everything to get my windows 10 laptop to connect to the sky safari orion skyfi adaptor and could not get it to connect for anything. I know the orion wifi was good as it worked perfect with my I-pad and sky safari pro 4. I tried virtual ports etc and could get the skyfi to showup on my wifi systems menu but no matter what I tried it would always say "unable to connect"..
raptor: I have not experience any drop out when using SS5 Pro. When I had it out last Friday night, I used SSP5 for 4 hours and never had a drop out. Other WiFi traffic does not seem to effect the adapter. Here at the house, there are no less than 5 WiFi routers visible including my own, so far no issues or interference has occurred when I use the adapter here at the house. When I use the WiFi adapter, I do the alignment with the Hand Controller (HC) then connect SSP5. I found that that I can use either the HC or SSP5 for gotos or to make adjustments; SSP5 does not care which, it adjust the cross hair to match where the scope is pointed. I gave some thought about trying to do an alignment with SSP5 but then remembered that the motor control board hardware for the Celestron GPS series is not compatible for alignments without the virtual HC. I would prefer to do alignments with the real HC anyway, if you do an alignment with a PC, smartphone or pad and the device shuts down, then you loose your alignment. If you align with the real HC and the device shuts down, you do not loose the alignment; just start the app again, connect, and your up and running again. dragonslayer1: Windows 10 saw the WiFi adapter as soon as I turned it on. I did have to give Windows 10 the password to the adapter but that was it. My iphone 5S also saw the WiFi adapter as it booted up and again all I had to do was give the iphone the adapter's password; that was it. After setting up SSP5 and making sure the adapter was set in the DTE position I made a connection first try, no fuss, no muss. It would have been nice if USConverter had made the DCE/DTE switch a "dip switch " so it would be hard to accidentally move from the DTE setting. I'm use SSP5 on my iphone 5S and looking to move it to an ipad mini 2 or 3. To use my PC running Windows 10 with an astro apps such as Sky Chart 3x, Sky Tools 2 or 3, Hello Northern Sky or The Sky X Pro, one needs to install and use a virtual com port (like one of these) to fake a direct, wired, serial connection to the telescope. Astrogeeks website explains this very well. Also, be sure to read the setup procedures for the app you will be using, since each app has its own nuances. Edited by Edward E, 17 February 2016 - 10:17 AM. I tried to use Celestron's SkyPortal app to connect to the WiFi adapter but could not. Looks like SkyPortal will only connect with a Celestron WiFi adapter. No biggy since SkyPortal and Sky Safari apps look and behave identically. Sky Safari has a lot more options under "Settings" and a few more icons at the bottom of the main screen that you can slide through. I ordered the adapter from US Converters yesterday. Even though my scope has built in WIFI, it's extremely frustrating due to constant disconnects, wild slews, etc. 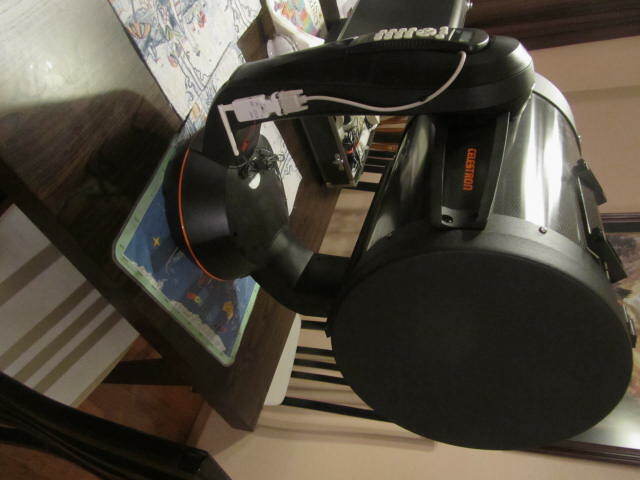 I've been round and round with Celestron tech support, trying various workarounds etc. I figured for $65, it might be worth it to try this. My mount has a built in 5V USB port that I'm hoping I can use to power the adapter. Then, I'll need some way to secure the device and cords. I'm thinking I might just use zip-ties and strap everything to either the accessory tray, or the tripod legs. Where do you keep your adapter and cables when in use? I'm looking forward to seeing how well this adapter works! Edited by Edward E, 16 February 2016 - 09:49 PM. I received my WIFI adapter today. I followed the directions for Android they provided and at first, had no luck. Turns out I had the wrong IP address of the adapter in SS. After fixing that, it immediately connected and I successfully slewed the scope using my tablet with no problems whatsoever. This was indoors during the day using a fake, 1-star alignment so I've yet to try it out at night. But, the forecast looks good for tonight so I'll give it a whirl this evening. Looks very promising so far! Edited by raptor(), 18 February 2016 - 01:39 PM. I watched your video and was pretty good. Have you been able to do the same using your windows 10 laptop also? I had a real nightmare trying to connect to the Orion wifi and their links telling different ways to do it can testify to the hoops to jump thru, virtual ports etc.......... And I never did get it to connect LOL..
Just a quick update. I used the new adapter last night for about 2 hours with NO disconnects or problems of any kind. One bonus that I found was that you can connect to the adapter in SS before doing your alignment on the HC. This will allow the tablet to send the date/time/location to the HC. 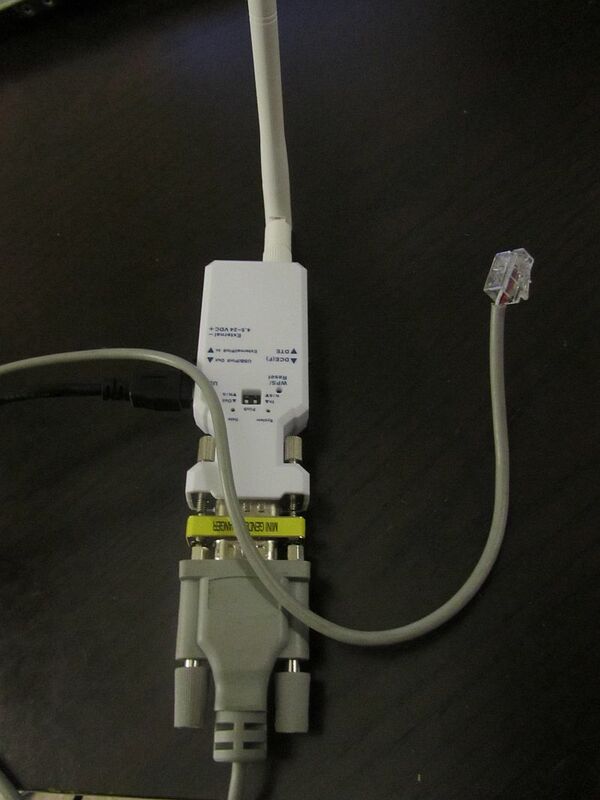 Then, just disconnect SS from the adapter, align with the HC, then re-connect. It saves you from having to manually input the date/location into the HC. Edit: Also wanted to mention, you can set this adapter up as an access point. 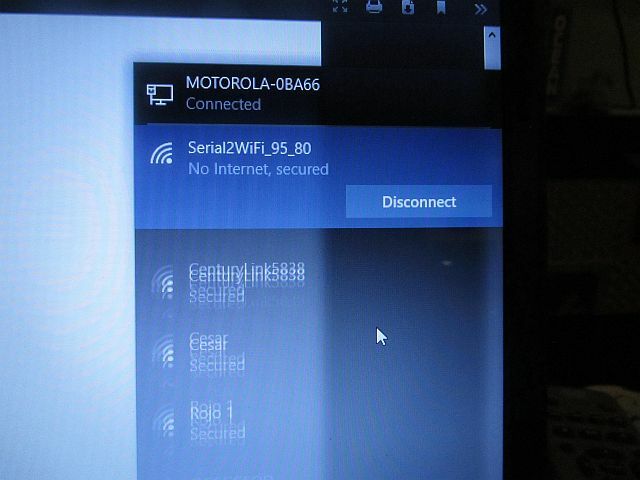 In this method, it connects to your wireless router. This allows you to be connected to the adapter from your tablet/phone AND also be able to be connected to the internet at the same time. Pretty cool! Edited by raptor(), 19 February 2016 - 03:27 PM. Hi Dragonslayer1, sorry for the delayed reply; I have been out of town. I'm glad you liked the video, thank you. One day, I will reshoot it and try to make it more "polished" and correct some terminology errors. Yes, you can connect to the adapter using software under Windows 10 per USConverter’s literature. I have been able to connect to the adapter via Windows 10 but have not used ASCOM/Astro software to control the scope. You do need software to create a Virtual Port so the ASCOM/Astro Apps thinks there is a “wired” serial connection with the scope. DON’T use the software USConverter has posted on their webpage; it acts like "hostageware". 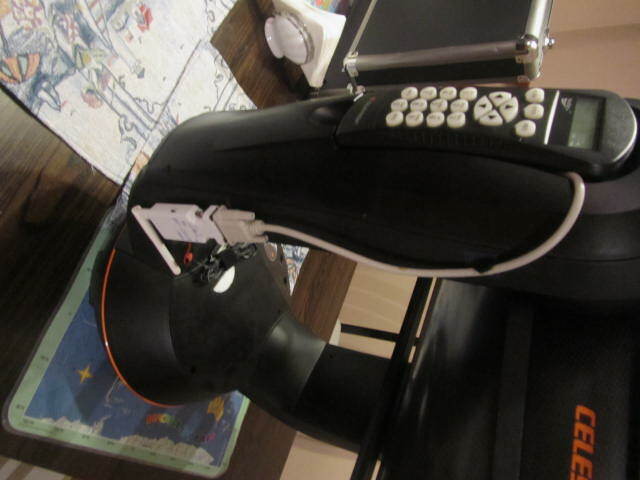 Once it is run, it forces you to register each virtual port you create and probable some payment is in order. 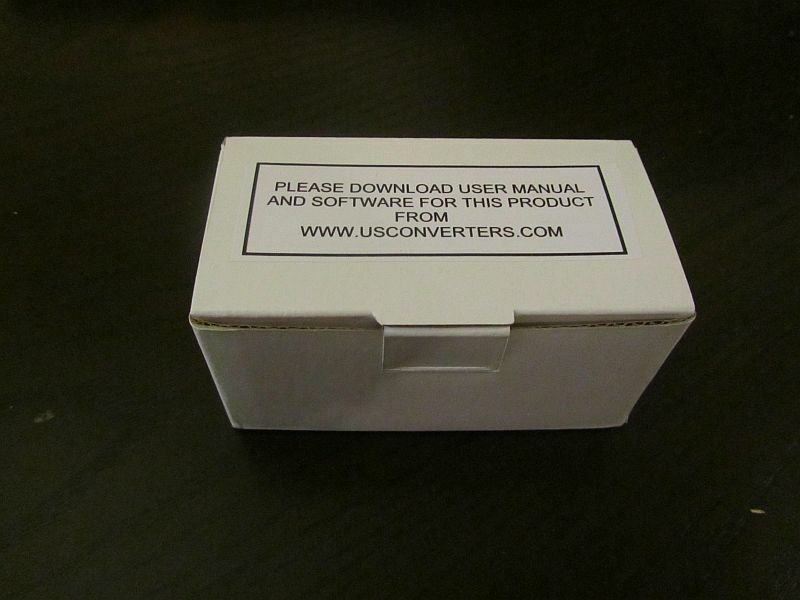 This is not USConverter's software just third party software they use. I'm testing out some free, open source software called "com0com" & "hub4com" that makes creating virtual ports "easy" and requires very little resources to run; will post my results using this software later in the week. raptor(), glad to hear that the adapter worked well for you too. 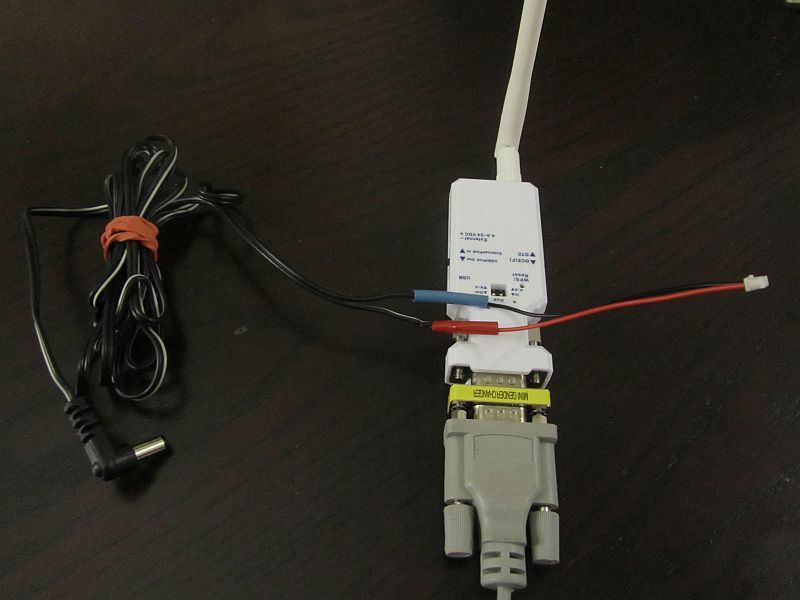 Yea, I read that you could connect the adapter to an access point, just never tried it but it is really cool to do so. In the past, I have seen many posts here on Cloudy Nights asking if there was an adapter that would allow you to do just this; well, now there is. Does you mount not have GPS on it? I let my C11 GPS set the date/time auto then I align it. I have not seen any difference between the time settings of the GPS vs computer time. I do not remember the last time I manually set the date, time on my mount. I ordered the wifi set up a couple days ago, has not arrived yet. I got experienced with virtual ports trying to get the orion/skysafari wi-fi unit to work... Never did work with my windows 10... On Skysafari home page with links to questions/answers etc there are some entries on getting skyfi to work with windows 8/ 8.1 etc. with info on virtual ports. I do not understand android tablets at all but form what I have read some say a Nexus 7 works great and I see some for ballpark prices of about $100-$200. Not sure on operating systems or even whats needed but that's not much at all, a lot less than an I-pad ) ..
From what I have seen, Android tabs work very similar to ipads. The Nexus 7 tablet uses the Android OS and based on raptor()'s experience, it is a snap to connect to the WiFi adapter and set-up SS (same experience I had using OS 9.x for iproducts), no virtual ports needed. You would have to use SS4 for right now, until SS5 is released for Android OS later this year. Let us know when your adapter arrives.